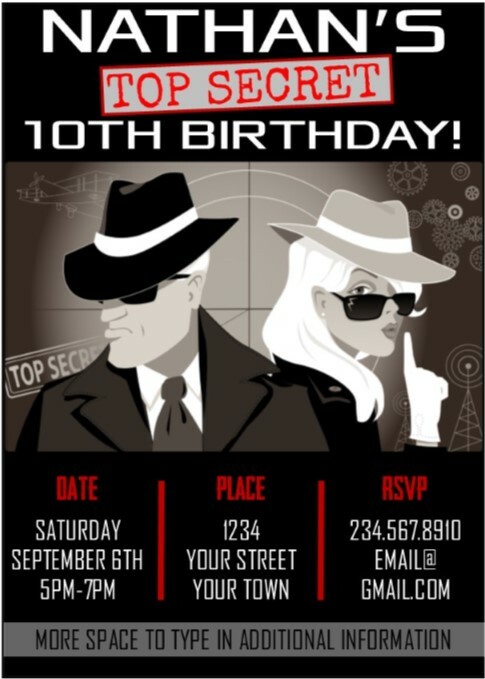 Spy Party Games - Secret Agent Birthday Theme! 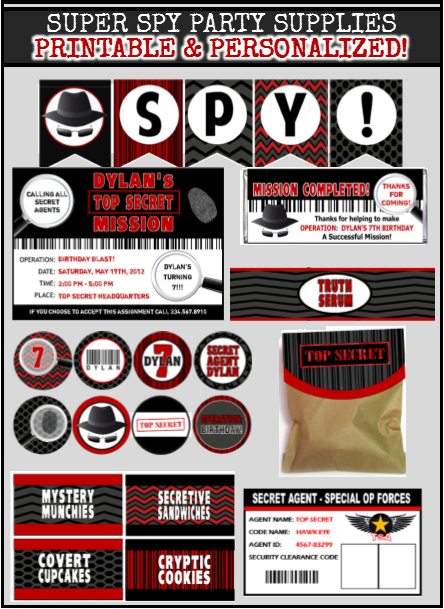 If your child is asking for a secret agent, spy, or detective birthday party theme you will want to check out the awesome spy party games and activities below because you will get tons on how to make your child’s birthday party fun, memorable, and one of a kind! Every secret agent should know how to create invisible ink messages and reveal them when needed. Choose one or all of the examples below and set up a station where kids can learn and practice their skills.The following shows two three examples of invisible ink fun. Invisible ink formula 1: The simplest way to create invisible ink is to use lemon juice and Q-tips to write a message on a piece of paper. Once dry the message will become invisible and any secret agent / spy worth his salt will know how to reveal it. Reveal method 1: apply heat. You can do this by holding the paper up to a lamp, applying hot air from a blow dryer, or even running an iron over it. Reveal method 2: Lightly scribble over message with wax crayon. There will be a difference in the way the wax will look over the lemon juice, enough to reveal the secret message. Invisible ink formula 2: This method involves creating the “ink” by mixing baking soda and water. Again write out the message on a piece of paper and let dry. Reveal formula: to reveal the secret message did your q-tip in grape juice and rub it over the paper. The baking soda and grape juice chemically react to reveal the secret message. MORE WAYS TO CREATE SECRET MESSAGES! Don’t forget about writing messages in code! Provide the children with Morse code sheets or cipher wheels and let them decode some pre-made messages or even practice writing messages themselves. 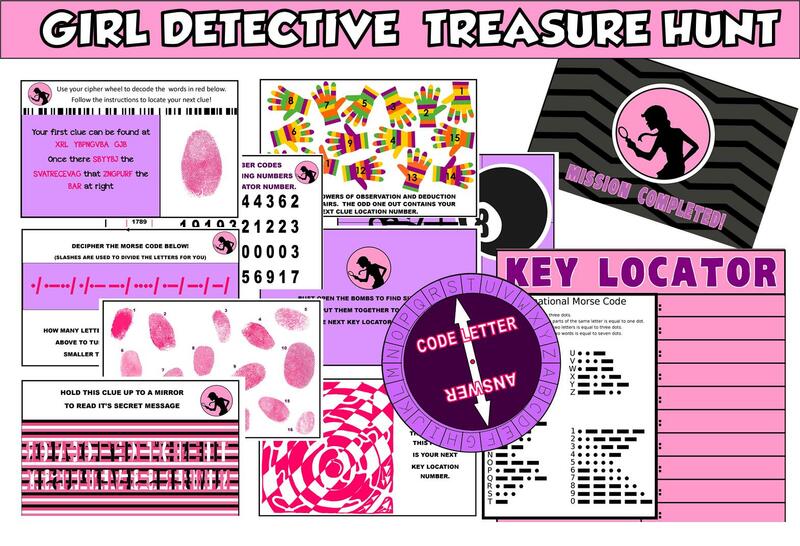 My printable Secret Agent / Spy treasure hunt includes both (seen below)! You see it in every spy movie. The spy or secret agent must make their way through a maze of criss-crossed lasers that will sound the alarm and ruin the mission with the slightest touched. Set aside an area to set up this game. You will string the yard around as the lasers. On each yarn laser attach a mini bell. 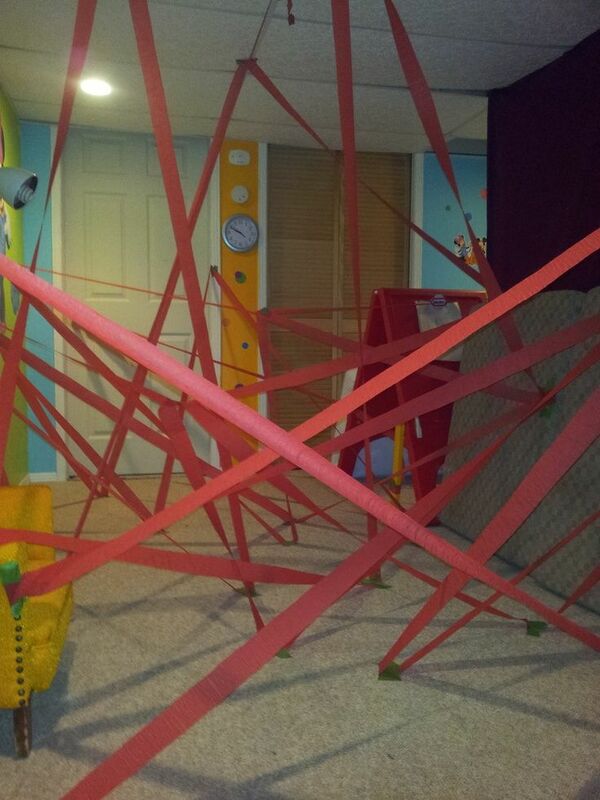 Criss-cross the yarn so that players will need to crawl under, over, up, and down to make it through the lasers. Set up an object at one end of the yarn obstacle. Start the players off on the other end. The object is to make it through the lasers, retrieve the object, and come back without ringing the bells. Start each player off with ten points and let each try it one at a time. Every time the make a bell ring they lose a point. The player with the most points at the end wins. 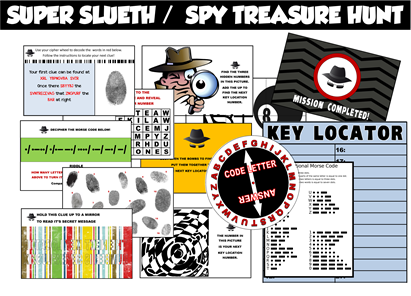 I created this printable spy treasure hunt so that it can be played anywhere. YOU decide the hiding spots. Each of the ten clues are different and provide a variety of challenges. 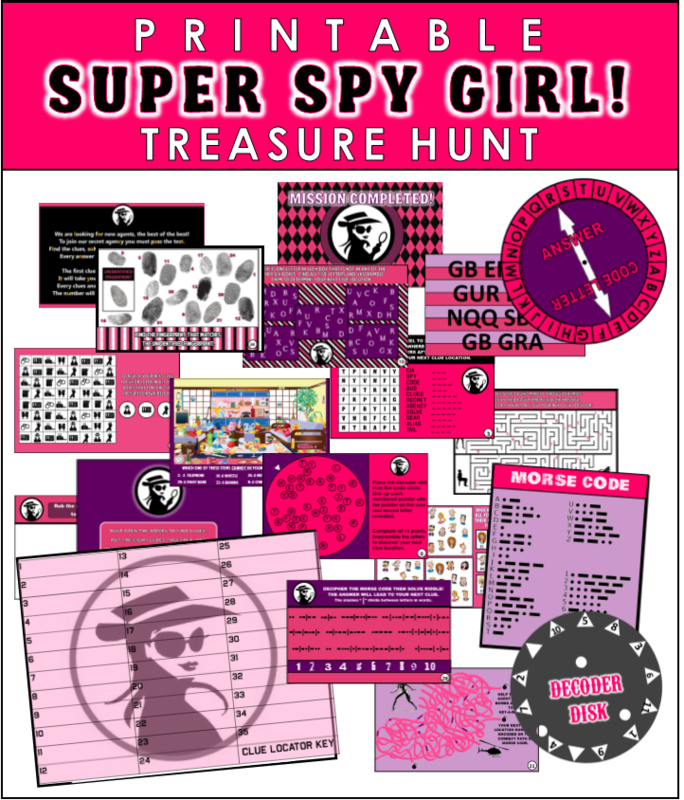 This spy treasure hunt kit includes tools to help the players along the way. These tools include a cipher wheel and a Morse decoder for each player. 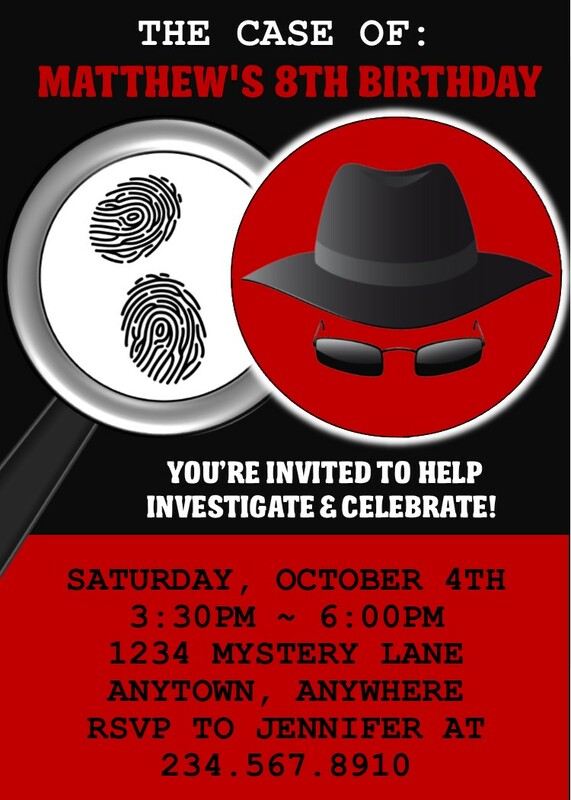 Players will get to solve riddles, crack codes, reveal invisible ink, match fingerprints, and more on their search for the “treasure”. Of course the treasure can be whatever you want it to be. 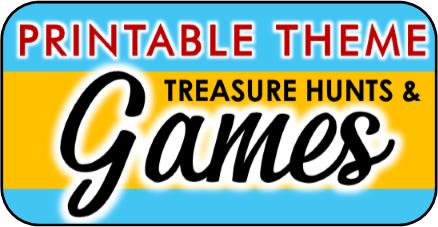 This hunt can be played as one whole group or it can be played in teams to see who can reach the treasure first. COMES IN original OR PINK & PURPLE VERSION! Editable key locator (this is where you decide on your hiding locations. Printable Cipher wheels Players will use to solve some clues. All you need to put together these fun code breakers is simple brads from your local office supply store. Morse code printables Players will need these to solves some of the clues. 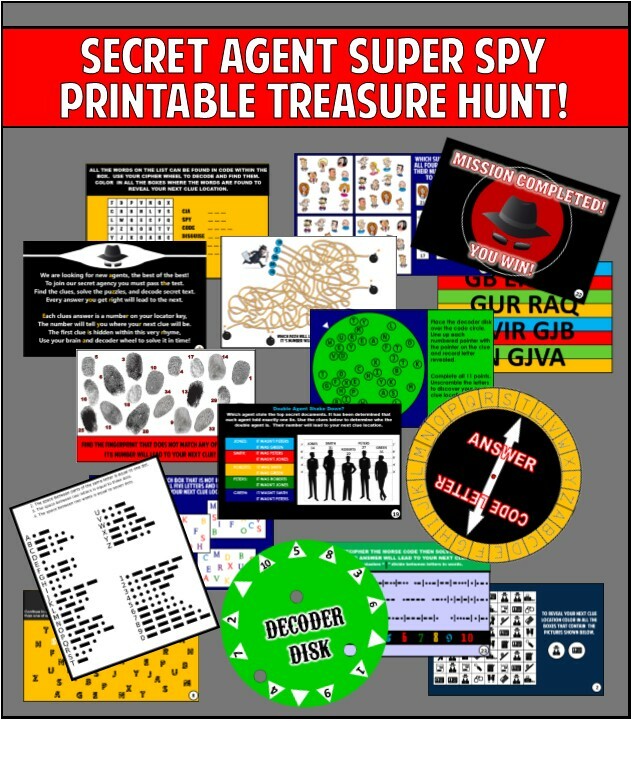 I sell this printable treasure hunt for $13.99. Once you complete your order it will be delivered instantly via email. If you have any questions about it let me know. Order your hunt below! For this game you will need one index card for each player. The index cards need to be cut in half. Using an ink pad let each child put a print of the same finger on each card. Divide the players into two even teams. Collect all the fingerprint cards from each team (keeping them separated). Hand each team the other teams set of fingerprint cards. These should be scrambled together so the identical sets aren’t all together. On the start of go each team must pair the fingerprint cards together with their match. The first team that matches all fingerprints correctly wins. 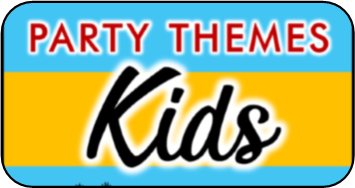 You will need a collection of fun and silly costume props, hats, sunglasses, mustaches, etc. You can find these items at the dollar store, thrift stores, or perhaps even in the basement. Divide players into two teams, and divide costumes up into two different suitcases. If you don’t have two suit cases use a brown paper bag or similar. Have the teams line up one side of the playing area and have the suitcases (or costume bags) waiting at the other end. On the start of go one player from each team must race to the suitcase, take out a top, a bottom and three other costume items (this could be a hat, sunglasses, and a fake moustache) and put them on. Then they race back to their team and take off all the items and pass them to the next player. 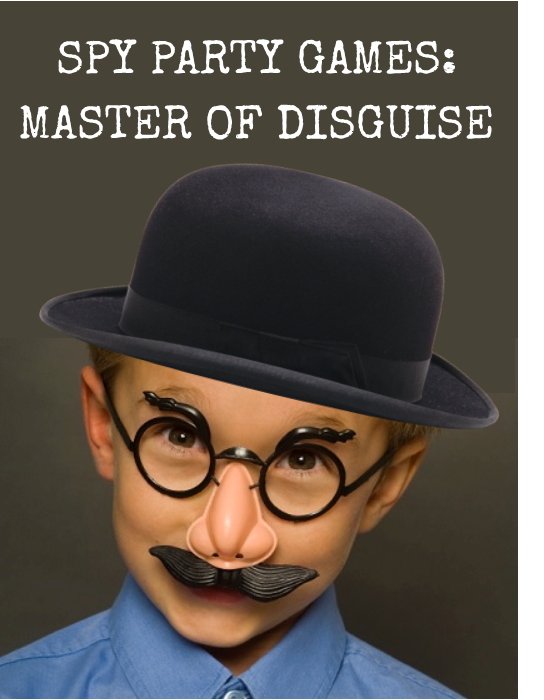 That player then puts on all of the items and races back to the suitcase and switches them all out for a new disguise combination. This continues until the last player has changed costumes and made it back to the team. For this you’ll need to make some dynamite sticks. You can do this simply by wrapping five paper towel rolls or paint rolls with red tissue paper (construction paper works also). Tape all of them into a bundle using black electrical tape. If you have spare wires or coils you can add those to up the cool factor. The video below shows you how to make a really cool bomb prop if you feel like getting crafty. The most important element is a kitchen timer or similar. This needs to be one that actually make a slight ticking sound works the best. Tape this onto your dynamite creation as well. To play the game wind up the timer and hide the dynamite. 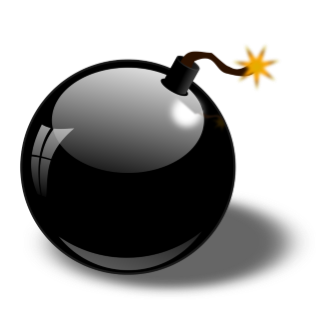 Tell the players their training mission is to retrieve the bomb before it goes off. Inflate a bunch of black balloons then create a “fuse” for them by tying a long piece of twine on each balloon and taping a piece of orange or red colored tissue paper (this is the lit part of the fuse) to the end of each piece of twine. Put them all together in a room and have the players rush to diffuse the bomb (pop them) as fast as possible. This game is even more fun if played to some Mission Impossible music. This printable hunt is a new exclusive party game we created. 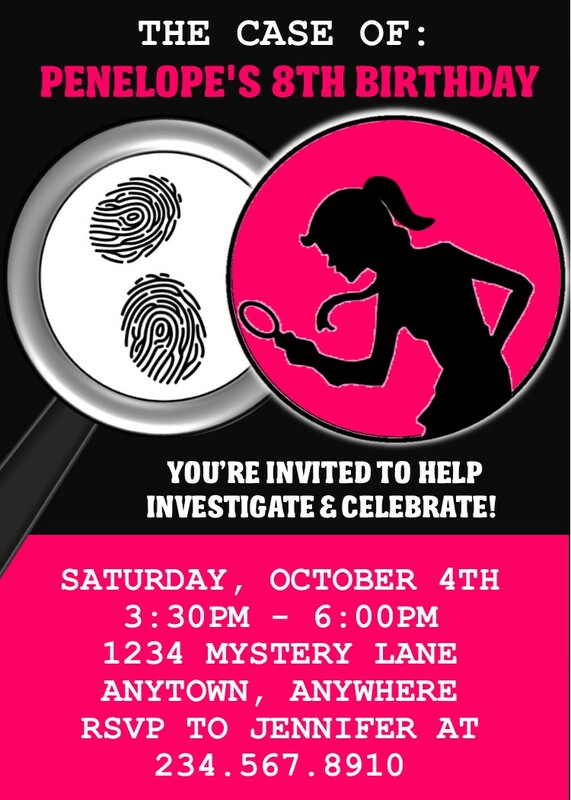 Our detective mystery party game is perfect when you want to add a little intrigue to your child's party. 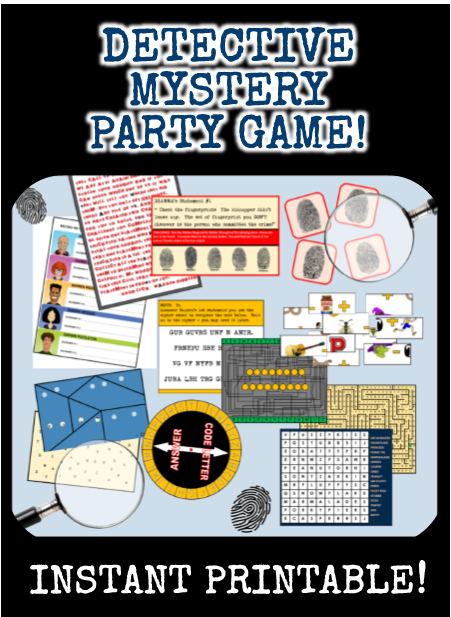 It was created for ages 8-14 and includes 10 unique and different challenges that players must solve, each provides a new clue to the mystery of who stole the party goodies. Once players solve all 10 challenges they use the 10 clues they discovered to determine which of the five suspects is the real culprit. Click here for full details, download instructions, and challenge examples! Climbing through objects such as old tires or appliance box. Having to dig something out of a kiddie pool before moving to the next obstacle. throw something through a hula hoop hanging from a tree. Do jumping jacks, sit-ups, or push-up. 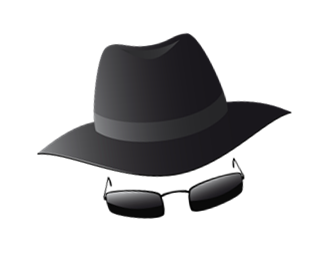 Guilty Party This spy training game is a great way to test the players body language skills. In the middle of the room is an diamond ring - plastic one of course. One player leaves the room. One player in the room must swipe the ring. The first person comes back in and has three chances (this of course can be changed depending on how many players you have) to guess who has the ring. If they guess correctly they win a prize. The thief is the next person to leave the room. 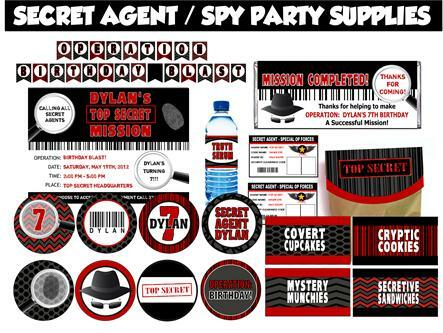 Personalized Secret Agent / Spy Party Supplies! 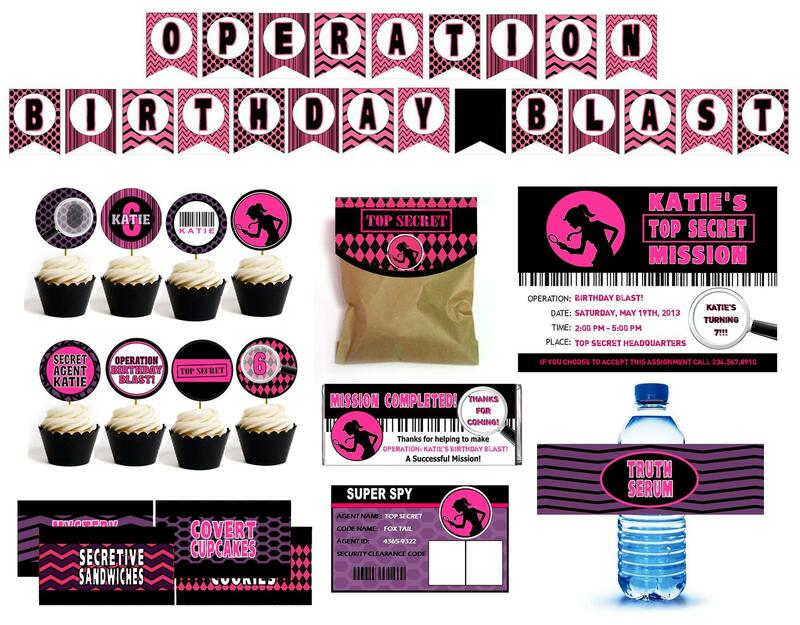 This Printable Super Spy Party Supplies Kit comes in editable files so that you can personalize it yourself! AND BLACK GIRLY GIRL VERSION. 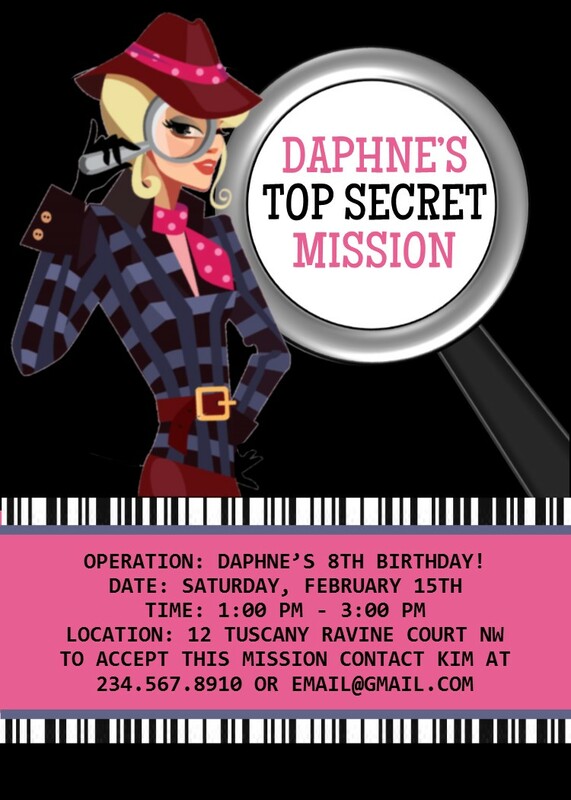 These invitations print 5x7 and come in a printable PDF file that you can personalize and edit before printing with your personal party details. These are ready for instant download so you can have you invitations out ASAP! COMES IN MULTIPLE COLOR OPTIONS!